The Graphics Factory (Hello Alberni’s patron sponsor) has launched a new website, featuring stunning aerial photographs from around the Alberni Valley. Pages on the website feature header photos from various parts of the City and other parts of the Valley. Check it out at www.thegraphicsfactory.com. Portal Players Dramatic Society’s next production is “Five Women Wearing the Same Dress”, a comedy written by Alan Ball (American Beauty, Six Feet Under, True Blood), and directed by Naomi Boutwell. Tickets are available for purchase online now by clicking here. Tickets are also available from the Capitol Theatre box office (250-723-1195) and Rollin Art Centre (250-724-3412). During an ostentatious wedding reception at a Knoxville, Tennessee, estate, five reluctant, identically clad bridesmaids hide out in an upstairs bedroom, each with her own reason to avoid the proceedings below. They are Frances, a painfully sweet but sheltered fundamentalist; Mindy, the cheerful, wise-cracking lesbian sister of the groom; Georgeanne, whose heartbreak over her own failed marriage triggers outrageous behavior; Meredith, the bride’s younger sister whose precocious rebelliousness masks a dark secret; and Trisha, a jaded beauty whose die-hard cynicism about men is called into question when she meets Tripp, a charming bad-boy usher to whom there is more than meets the eye. As the afternoon wears on, these five very different women joyously discover a common bond in this wickedly funny, irreverent and touching celebration of the women’s spirit.During an ostentatious wedding reception at a Knoxville, Tennessee, estate, five reluctant, identically clad bridesmaids hide out in an upstairs bedroom, each with her own reason to avoid the proceedings below. They are Frances, a painfully sweet but sheltered fundamentalist; Mindy, the cheerful, wise-cracking lesbian sister of the groom; Georgeanne, whose heartbreak over her own failed marriage triggers outrageous behavior; Meredith, the bride’s younger sister whose precocious rebelliousness masks a dark secret; and Trisha, a jaded beauty whose die-hard cynicism about men is called into question when she meets Tripp, a charming bad-boy usher to whom there is more than meets the eye. As the afternoon wears on, these five very different women joyously discover a common bond in this wickedly funny, irreverent and touching celebration of the women’s spirit. 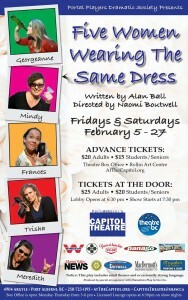 “Five Women Wearing The Same Dress” opens on February 5 and plays on Friday and Saturday nights at The Capitol Theatre until February 27. This show comes with a note for strong language and adult content. We’re back with another episode of the Hello Alberni Podcast. After a very successful “An Evening Out” with Dennis Olsen at The Capitol Theatre on February 2, a donation total of $1,231.75 was raised and given to the Heart and Stroke Foundation. In this episode, you’ll hear from Sara Mazzei of the Foundation about what their group does, and you’ll hear Dennis Olsen explain why he chose Heart and Stroke as his charity. Guitarist Dennis Olsen presents donation cheque to Sara Mazzei of the Heart and Stroke Foundation. At left, co-producer Denis Levasseur and at right, host Peter Wienold. Big thanks to the AV Times for covering our donation to the Heart and Stroke Foundation of Canada. We’ve got a special treat for you this weekend – it’s Part 1 of our Dennis Olsen chat that was held February 2, 2013 at The Capitol Theatre. In this podcast, we speak with Dennis about how he got started in music and discovered his passion for playing guitar. It’s a fascinating journey, including some world travels. Musically, the audience enjoyed Dennis’ classical guitar stylings, many of which you’ll hear in this podcast. Thanks go out to my co-host for “An Evening Out”, Denis Levasseur. Our technical team included Ken Wiegand on sound operations and Nathan Satterlee in the booth running the lights for the show. Paul Blondahl took the great photos you see here. Partial proceeds from this event will benefit the Heart and Stroke Foundation of Canada – by the time Part 2 of “An Evening Out” is posted, we’ll have the final donation amount to share with you. Dennis Olsen, Peter Wienold and Denis Levasseur.